The USS Amesbury or Alexanders Wreck is a perfect example of a very successful artificial reef for anyone scuba diving Key West. The USS Amesbury's old navy hull is adorned with coral and oysters. It's also home to a broad spectrum of Florida marine life including goliath grouper, barracuda, and mackerel. This navy vessel led an illustrious career during World War II before she was eventually decommissioned. The USS Amesbury served with the Atlantic Convoy 7, and was part of the historic Normandy invasion. She also took turns performing a variety of functions and duties when she returned to the United States in 1944. Eventually the USS Amesbury was equipped with a five-inch turret gun and 3 twin mount forty-millimeter antiaircraft guns before leaving to fight in the Pacific Ocean. These guns are with the USS Amesbury still today. Upon returning to Florida in 1946 the USS Amesbury was decommissioned. In 1962 she was purchased for scrap by Chet Alexander, a marine salvager from Key West FL. In 1972, Mr. Alexander made plans for this vessel to become an artificial reef in the deep water of the Gulf of Mexico. While towing the old navy ship to her final resting place, she inadvertently ran aground. Before she could be refloated, a strong storm came through the Gulf. Her hull was broken in two, forever ending the possibility of reaching deeper water. When Key West diving on Alexanders Wreck you'll find the two sections of this old navy vessel lying approximately 200 yards apart. At the south end of the wreck diving site you'll encounter the bow and port side. The five inch gun mount and the twin mount forty-millimeter antiaircraft guns rest about 50 feet behind this section. The stern and starboard side are situated at the north end and a debris field including sections of the bridge, upper hull and superstructure are on the east side of the hull. Resting on her side in very shallow water, a portion of the stern sits at surface level. This has created an ongoing hazard for marine traffic, and poses a problem for Key West divers as sections of the stern are extremely jagged. 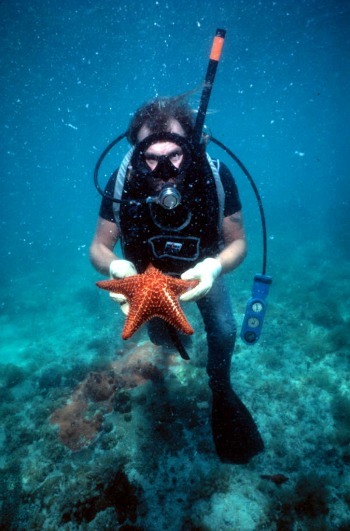 Located in the Gulf of Mexico, close to Cottrell Key and within reasonable proximity of Key West FL, Alexanders Wreck is popular for anyone diving Key West when the Atlantic is too rough and choppy. 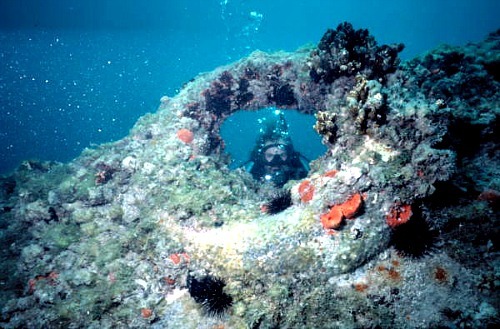 Visibility can be poor, but the opportunity to investigate the military equipment and discover a naval artifact make this a very worthwhile Key West scuba diving site.